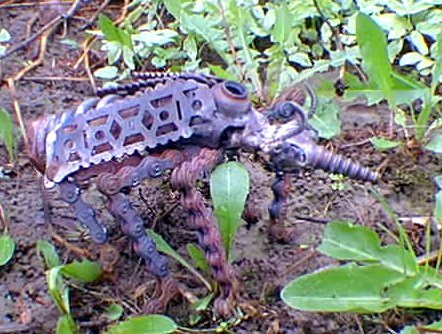 January, 2003: Inspired by the work of Adam Williams' sculpture work made from "good junk" that he scrounged from the side of the road on trash day, I (with his permission of course) decided to raid his scrap yard and try some found-junk metal sculpture. 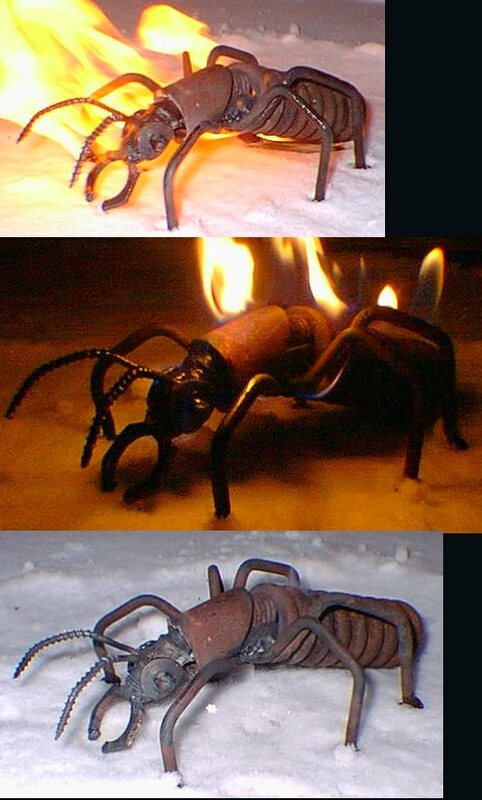 These are made from all sorts of metal things. 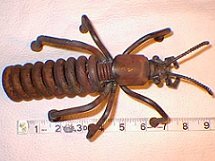 Bicycle parts, big springs, little springs, nails, screws, ball bearings, and other odd bits and pieces; all welded together to make giant (or merely huge, slightly large, etc.) bugs of one sort or another. These so far have taken me about 2-4 hours to make. I will add more as I make them. Also, if metal bugs interest you (well, I think they're kinda neat anyways), check out the chainmaille bugs in the chainmaille section of my website. Objects used: 4 screws, 1 bolt, a spring, steel pipe, 6 nails. 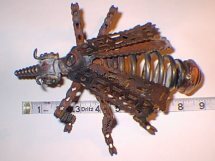 Objects used: 6 nails, 2 springs, "U" shaped metal bracket, 2 chunks of metal & large flat nut from stearing column of bicycle, 2 ball bearings and parts from a bearing hub, 2 screws, curved washers from bicycle brake assembly. Objects used: old brass gas nozzle, 2 screws, various parts from 2 metal bicycle peddles (entire bearing assembly except for the bearings, decoratively punched metal plates), 2 springs, bicycle chain cut into 6 pieces, 1" of steel wire, copper nut cap/pipe fixture, 1.5" of 1/4" steel rod. Same one as to the left, but playing dead on the windowsill. The bike chains for legs allows for some degree of articulation. 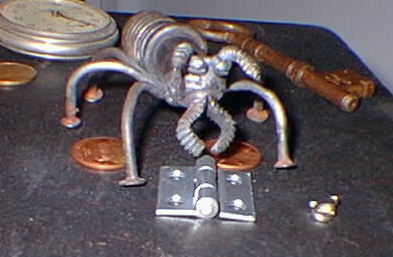 small welds keep most of the chains inflexable but the leg joints were left unwelded. 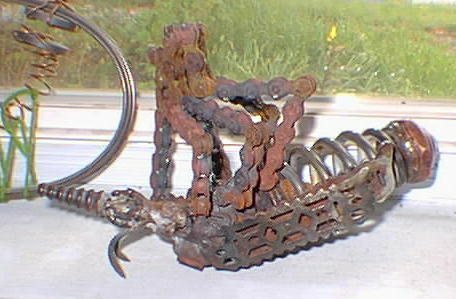 A combination of rust in the joints and hammering the pins to tighen them stiffened the joints enough them to stay in position. I have no idea if there is really a fly called a Mueller Fly, but the word Mueller is stamped on the top of the fly's head (the gas nozzle)... so I've decided to call it a Mueller Fly.